The perfect protein for good health. Don't know much about beef cuts? If you don't know much about beef cuts, that's ok. Here's are some quick notes that might be helpful to you. The thing to remember is that beef is just muscle tissue, and so the more the muscle is used, the tougher it will be. 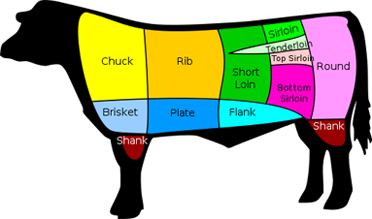 Therefore the cuts that tend to be on the lower part of the cow (like brisket, flank, and plate) will be tougher, whereas the cuts on the upper part of the cow (like loin and rib) will be more tender. Plus, the cuts that are near the front of the cow (like blade aka chuck) or the back of the cow (round) will also tend to be more tough compared to the loin or rib. OK, that being said, the tougher cuts of beef are also often the more flavorful. And so, some people actually prefer flank steaks because they're so tasty, even though of course they'd need to be marinated in order to make them more tender. That's the thing. If you order a tougher cut of beef, you can still ensure it'll be tender by simply marinating it, and/or tenderizing it. Plus, if you use moist heating methods that tend to cook the beef more slowly (like a slow cooker, or a covered roasting pan, both of which lock in more moisture) you can't really go wrong. The dry cooking methods (like grilling, or rotisserie) are wonderful for the more tender cuts of beef, but they can be more difficult on a tougher cut. OK, what are the best cuts? It's debatable, some people think tenderloin is the best, others prefer the prime rib, and so on. But basically the tenderloin is the most expensive --- there's not very much of it on a cow, plus it's always in high demand. The striploin or t-bone (basically the same thing only the t-bone of course has a bone in it) is also considered top-notch. Again, it comes from the section of the cow called the loin. When it comes to steaks, the Sirloin is considered less desirable than the Prime-Rib, Tenderloin, and Striploin/T-bone, but it's still of nice quality. It's always an idea to marinate or tenderize the sirloin, in our opinion. As for roasts, the Prime-Rib (which can be made into either roasts or steaks) is considered the best by some, although the round roast is wonderful too it's just that it definitely requires slower-cooking using a moist-cooking method (ex. pot roast). By the way, lean ground beef and stewing beef and stirfry are generally made from the lower-quality cuts. Plus, as the butcher is trimming the meat, smaller pieces will be left behind which can't go into steak or roast, so they get turned into lean ground or stewing beef or stirfry etc. Of course, things like sausages and pepperoni and smokies and the like get made out of the same pieces of meat that get used for lean ground or stewing beef. We hope this helps! Place your order here.